American Heavyweight Boxing Champion, considered one of the greatest athletes in Boxing History. On his own passport his height was listed as 6ft 2.5. @Canson - yeah, I have the DVD boxset on Ali - I haven't watched it for a long time but in reply to Terrell's height advantage I recall Dundee went as far as to say "my guy is still growing, he's already 6'4"". @Chief - Context - Dundee said Ali was 6'4" specifically in 1967 because Ali was about to face 6'6" Ernie Terrell - Dundee was trying to talk down the height difference. Dundee also said Ali was 6'2". Dundee said a lot of things that weren't exactly true - as a savvy trainer he simply bent the facts in favour of either himself or his fighter - so it's kinda hard to quote Dundee's words as evidence. I recalled reading years back that 18 yo Ali was listed at 6'1.5" as at the time of the 1960 Rome - Olympics - I found a site which appears to corroborate my memory - Click Here - you can find other listed heights for boxers such as Foreman, Lewis, Bowe etc. - I can't vouch for the overall accuracy of the site's listings at least as the time of each fighter's Olympic appearance but Ali's height seems right as at the Olympics. Interesting to note as per that site 19 yo Foreman is listed at 6'3.5" as at the 1968 Mexico Olympics -and I have read that previously elsewhere also. IMO 6'2.5" seem about right for Ali - obviously accepting that Ali grew about 1 inch post 18 yo. At 22 yo Ali was listed at 6'2.5" for the first Liston fight. It seems 6'3" was a round up that took hold shortly after that. One common comparison point was to Joe Louis - who was listed variously at 6'1", 6'1.5", 6'1.75" and finally 6'2" later in his career. IMO Louis was about 6'1.5"-6'1.75" - and Ali often didn't seem to hold the advantage a 6'3" should've held over over Joe - though they were often photographed with Ali in thin heeled boxing shoes and Joe in street shoes - some photos they look quite close while in others Ali appears clearly taller - usually when both were in street shoes. Suffice to say Louis wasn't quite as small a HW as Ali tried to paint him in order to suggest that Joe couldn't compete with him - Joe appeared alongside a number of 60s/70s fighters like Liston, Frazier, Quarry, Chuvalo, Foreman, Lyle, Holmes etc and in even in older age Joe's size/height held up pretty well - when Joe refereed Frazier v Quarry Louis was easily the tallest man in the ring IMO by several inches. I think in the 1960's he was at least 6' 4". Why would he list 6’2.5 on his passport if he’s really 6’3 or 6’3.5? Definitely at least 6' 3". If not then 6' 3" 1/2. Angelo Dundee once said he was 6' 4 in 1967. I have Ali at 6’2 flat and Foreman at 6’2.5inch. Rob, did he have a 10 inch plus head size? Could have been 9.5-10, possibly more chance towards 10 than 9.5. I steadfastly believe that you guys are right on Ali’s peak, fighting height being 6 ft 2.5 (189cm) instead of the 6 3 (191cm) cited on Boxrec & Wikipedia (these sites are NOT IN ANY WAY expert when judging the heights of boxers!). Rob, please could you look at some old yt vids of the Argentina monster, Carlos Monzon, & do an entry (estimate) of his height. Monzon, and not Marvin Hagler or Ray Robinson, was the greatest 160 pound world champ to step into the ring (just an opinion). He was a mean & very crafty boxer who was regularly listed in publications as being 5 ft 11 and a half (or at least 5 ft 11and a quarter). Ali was never ever under 6 foot 2 , great listing . Take this List and Average it: ALi's Opponents in the 1970's averaged a Listed height of about 6'1.5" and a recorded weight of 208 pounds. Holyfield was 6'2 and 215 pounds in the 90's as was called a small heavyweight and he is still bigger than Ali's Average opponent from the 1970's, both in height and weight. 6'1-1/2" and 208 pounds is small nowadays and that's who Muhammed ali fought in the 1970's when Averaged out. His opponents in the 1960's were even smaller. Again I will say, Modern Heavyweights are taller and Heavier than in the past. The fighters may have been smaller in the 70s but that was before the widespread use of steroids. They were also better and more skilled or at least there were many more good fighters in that era. The sport has collapsed in the US particularly at heavyweight. Big athletic guys no longer see boxing as worth pursuing when there is more money in football and basketball. The idea that everyone who played sports or was about in the 70s was a midget is false. Height has only marginally increased since those days in the US and UK at least. There were some big men boxing in the 70s. IDK man I got a whole chronicle from you so you are not doing a great job of ignoring me. And Actually Ali's Opponents in the 70's would be really small nowadays. You can throw all the insults you want, but the internet exists and people who use it can easily render you whatever insult comes to their mind. Those people you listed that Ali fought in the 70's....Again would be small nowadays.
" I also can name 50 heavyweight contenders in just the 70's alone who were between 6'3 and 6'6." I'm still waiting for this list. Weak 6-3 peak. The look on his face when I had him sign his 1964 Columbia Records LP was priceless 30 years ago. 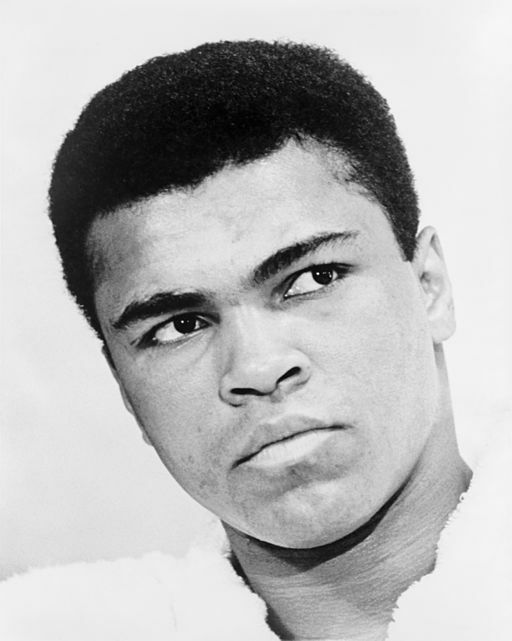 He signed it Cassius Clay,kinda a no-no for Muslims. If you ever meet the famous, always bring a super-cool item to get signed not some common 8x10. @Canson: the quote clearly indicates that Sachs was literally open to and inviting the possibility that GF is 6'3.5" - not just saying he looked it in that video - yes he has otherwise had GF at a flat 6'3" - he claims to be dead set against any higher -responding inappropriately to anyone who disagrees. YET he still asked the question. Therein lies the contradiction and hypocrisy. If one concretely feels GF is 6'3" flat whilst perceiving GF as taller than O'Brien then they would conclude O'Brien to be less than 6'3" or put GF's perceived advantage down to angles or footwear - they certainly don't ask if GF could be rounded up to 6'3.5" - a .5" more than the absolute max. (6'3") they otherwise claim GF to be. I'll also repeat that the custom angle O'Brien is usually filmed greeting his guests does disadvantage O'Brien a bit and accounting for same I actually see them as even - and you know I have O'Brien pretty much as you do - at about 6'3.25" which I won't change to try and pump up GF - and you and I are in fact in the minority on that opinion - the majority believing O'Brien to be about a good .5" taller than we do. Correction on Conan O'Brien - my estimate is 6'3.25" NOT 6'4.25"
@Tall in the Saddle: I don’t think Harry Sachs was asking for an upgrade to 6’3.5 for Foreman. He has always had him at 6’3”. He was simply saying that he thought in that particular video that he may have looked that. @Serengetiman - When Clint stands to greet Ali - the best view point to compare them - I think they look even. The angles in later shots aren't so good nor is Ali's posture vs Eastwood's. Problem is later in the interview Ali himself said that Clint was taller - which we presume Ali perceived upon meeting Clint unless Ali was deferring to Clint's popularly listed and inflated height of 6'4". Canson Foreman looks taller than Conan in that video don't you think? We can't see their shoes but if you think Conan at his peak was 6'3 1/2 to 1/2 then would you round Foreman's prime height up to maybe 6'3 1/2? Too funny. You also stated that everyone here knows that GF is 6'3" - the average guess here over 39 votes (not incl. my own) is 6'3.19" - there you go again flying in the face of facts to suit yourself. I actually post to other height threads and can actually make my OWN calls on other heights including that of Conan O'Brien - who I credit at a well reasoned 6'4.25" - my estimate well documented on that thread - in the clip GF did not appear taller he appeared even with Conan. Believe me other contributors KNOW who to ignore if they so choose and need no instruction on same. I don't need to ignore you - you're easy to disprove - but you do need to ignore me because you obviously can't handle that. Canson you see my point with Tall in The Saddle? How he will only use points that benefit him? I put up numerous links that stated Foreman and Larry Holmes were 6'3 in their primes. You put up pictures and links to prove Foreman and Holmes are 6'3. Yet he wants to believe Foreman and Holmes were 6'3 1/2. Why bother even typing to him? What will it solve? Some people enjoy trying to prove their point but there is no proving your point with people like him. Just ignore the kid. @Canson - Rob's pic is with an older Holmes (height loss?) and Larry isn't standing straight. Holmes and Foreman do appear more or less equal in some shots but Foreman appears to have dropped more height than Larry over time. If someone is an actual 6'3" but claims 6'4" then that is a blatant exaggeration. Being 6'3.5" but claiming 6'4" not so blatant but still a self serving round up all the same. Holmes and Foreman were listed at times at both 6'4" and 6'3.5". I think the former height was a round up and the latter height more accurate for both. 6'3" simply became the rubber stamp height settled on for many fighters during the 1970s - even if they were in fact a bit under 6'3" or conversely a bit over 6'3". It was unlikely that so many fighters of the 70s were bang on 6'3" as listed. As to people judging someone to be their own height - is not possible to err in judgement when only .25"-.5" diff. is involved and the other party isn't necessarily involving/straightening themselves for comparison? I've seen plenty of people look face to face and one claim they are the same height when from my perspective the claimant is actually dropping as much as .5". @McMurphy - that pic you linked I have seen. It's as close as I've seen Ali to Holmes height. Generally Ali looked a bit shorter than that as compared to Holmes. Don King is about 49 in that shot - a mug shot in the early to mid 1950s listed King's height as 6'2" (easy to find pic). Without height loss for King I think you could argue a solid 6'3" for Ali based on that pic - However,IMO, that pic is somehow skewed, having Ali appear a bit taller than his actual 6'2.5" at that stage. Canson I can't find any recent pictures with Holmes and Foreman standing straight next to each other. I found a few pictures where Larry is hugging a slouching Foreman. The picture that Rob had with Larry Holmes is from some years back so Larry could of lost height since then as well. Holmes looks 2 cm taller. Smaller head too. I got Ali at 189 cm and Holmes at 191, just like this site says. The incisive wit and wisdom of Sachs - "You are a idiot" - "I completely own that idiot" - "Dumb dumb" - "You aren't bright"
If that can pass then replies in kind should be okay. Sachs, I'll throw you a bone - 70s HW Jeff Candy Slim Merritt listed 6'5"(and actually looked it) - now if you behave Harry another one might come your way. Richard Dunn was NOT 6'4". He was 6'3" if that. Use the eyes - Ali is in no way dropping 1-1.5" to Dunn and actually appears taller at ring instructions 13.20 or move to post fight iv 33.25 also if you like . Lol Jordan87 I ignored you because you are a idiot. I said fighter in the 70s were taller and you keep bringing up fighters Ali fought in the 60's. I know you aren't bright but the 60s and 70's were 2 different decades. Jimmy Ellis was 6'1, Buster Mathis Sr 6'3, Mack Foster 6'2, George Foreman 6'3, Ron Lyle 6'3. Al Blue Lewis 6'3, Bob Foster the light heavyweight 6'3, Chuck Wepner 6'5, Ken Norton 6'2 3/4, Joe Bugner 6'4, Jinny Young 6'2, Richard Dunn 6'4, Leon Spinks 6'1, Alfredo Evangelista 6'1 1/2. If you want to add Larry Holmes then he was 6'3. Joe Frazier and Jean Pierre Coopman were the only fighters in the 70's Ali fought who were under 6'0. I guess you didn't know there was a thing called the internet. But watch you keep bringing up fighters Ali fought in the 60's to prove your little point. Also Also you know Ali is only one fighter? Again I know you are pretty slow but there were other fighters in the 70's. Besides the guys I mentioned it is funny how you ignored Leroy Jones and Al Jones who both 6'5, You ignored Gerry Cooney who was 6'5, Rodney and Duane Bobick were 6'3, Larry Middleton 6'5, Jack O'Halloran 6'6, Tony Doyle 6'4, James J Beattie 6'9 1/2 , Ollie Wilson 6'5, Stanford Harris 6'5, Roy Williams 6'5. Watch you bring up more fighters that Ali fought in the 60s like a dumb dumb. Tall in the Saddle somebody tore me down? I completely own that idiot like I am going to own you. But of course as usual with people like you ,will you will pick and choose which information you believe. Which is why I ignored you and the other guy the first time. Rob how tall do you think Sonny Liston and Jack Dempsey were? Both were listed as 6ft1 and 6ft0.5 in the past. Which mark you believe was closer? Don't think Sonny was far off his billed height, though I've not looked much at Liston or Dempsey so don't have as much knowledge. McMurphy - I agree big heels a 70s vibe - I wouldn't necessarily say Norton was trying to appear taller than he actually was but maybe with Foreman he was looking for a bit of psychological edge - the "advantage" he held over Foreman in the clip I linked was more than he ever appeared to hold over Ali. Norton and Ali weighed in on the Johnny Carson show before their 2nd fight - unfortunately the video was pulled from YouTube some time back. See Norton with Yaphet Kotto in Mandingo to compare Ken with a solid 6'4" guy. Williams was listed at 6'2" but sometimes credited as 6'3". Ali himself described Williams as tall so I'm thinking without heels Williams was close to if not equal to Ali - prob more in the 6'2.5" zone like Ali. Here's great vid of young Cassius Clay on the Steve Allen show 1963 after victory over Henry Cooper. Steve Allen was listed as 6'3" and clearly had the edge on 21 yo Ali. Now if Allen was an exact 6'3" I can see an argument for Cassius to be only 6'2". There are only a few sources for Allen's height and I'm not going to inflate Allen for the sake of Ali - it's just that there are comparisons with other people that tell me Ali was at least 6'2.5" peak. Ali in dress shoes and Cleveland Williams in Cowboy boots. Norton usually wore high heels in the 70s fashion vibe. Ali on the other hand always wore clasic dress shoes when in public. I can't link the photos from the site, but there are stills from the Ali - Norton weigh in where both wore sandals and they are clearly the exact same height. 6'2.75" looks nailed for both. Foreman edged Ali and Norton by a bit, like half an inch. Strong 6 foot 3. Interesting photo in promotion of the third Ali-Norton fight. Ali and Norton have donned the trunks but kept their street wear shoes on - unless an illusory effect has been created by a shadow, check the heel on Norton's shoes! Ali's heel appears standard. Perhaps this is the secret behind Norton's advantage over Ali we see in some photos outside the ring. Also here is a clip for the signing of the Foreman-Norton fight and toward the end of the clip you'll see Norton appears impossibly taller than Foreman - again, likely some decent heel being worn. Finally, I read Norton was measured at 6'2.75" in the Marines but have not seen the primary source for same. At any rate, Norton joined in '63 and was likely 19 but possibly 20 yo so further growth of at least .25" wasn't impossible. Harry is just hurt b/c he either Checked Wikipedia or Boxingrec and found out Ali fought 15 + Opponents who were 6 foot and below and nearly had a breakdown. So He thinks he can maybe try his luck with you, except you are also aware of the Fact that the internet exists. Point is, this fellow Sachs no longer maintains his original idea that the heavyweights are not taller nowadays since I have proved him wrong on that. ( Again, it took me 5 mins to check BoxingRec) so now he has to move on and make it about Foreman's height. Sachs - Quote - " IT is funny when people like you just lie to prove your point with absolutely no proof to what you are saying". Stupid is as stupid writes. Obviously you didn't have the capacity to respond to a previous post specifically addressed to YOU - a post which unequivocally tore you down - it screamed for a reply but I guess it had you Gumped. So what was your next best option? Move on to try and troll the next poster. Bad move. I know my subject while you obviously don't. These are just a few examples of the heights I referenced being quoted or listed. There are others examples - anyone who truly has knowledge of the sport would know them. Have a read, let it sink in and then the only suggestion I have for you NOW is: run Harry run. Louis v Sharkey 1936 Louis height 6'1.75"
Foreman v Luis Pires 1971 Foreman Height 6’4” - at 59 sec mark Don Dunphy describes Foreman as 6’4”. Ali vs Lyle 1975 Lyle 6’3.5” – at 22:13 the Tale of the Tape is put up and Lyle’s height is listed as 6’3.5”. Holmes vs Shavers 1978 Holmes Height 6’4” - at the 1:21 mark Cosell describes Holmes as 6’4” – which is a height that was also afforded to Holmes in various boxing publications around that time – including Ring Magazine. The In the Saddle Foreman was never described as being 6'4 in his prime. That is just a lie Foreman told in his comeback. Give me a link that has a prime Foreman being 6'4. In his "prime" Foreman was always listed at 6'3. Ron Lyle was always listed at 6'3, Holmes was always listed at 6'3. Joe Louis was always listed at 6'1. IT is funny when people like you just lie to prove your point with absolutely no proof to what you are saying. I have Ali 6'2.5" but at times when much younger and standing straighter appearing to be closer to 6'3". Foreman, Holmes and Lyle all at 6'3.5". Foreman was described as 6'4" at various times in his first career NOT just his second coming. Holmes too. Imo 6'4" was simply a round up from mid inch for both men. The talk of Ali being 6'4" and still growing was simply a Dundee concoction leading into the Terrell fight to negate the height pull. Terrell was 212.5 lb for Ali not 205 lb. Imo Joe Louis was closer to 6'2" if not right on that mark. IMO, there are a number of comparative visual references to support same - not the least being referee Joe's clear height advantage over 6 ft Quarry and 5'11" Frazier II (difference in footwear factored). Also, for another reference see pre fight intros for Ali-Norton III about 2.08 m mark. Joe approaches 6'3.5" Holmes and Lyle who look even, in background you can see 6'1" L Spinks in Marine Uniform and 6'2" Bruce (formerly) Jenner. 62 yo Louis looks to be holding his peak height very well but could guess he'd a lot a tad. Look at Muhammad ALi's career. I'll help you out, it's easy. I counted 15 Fighters ALI fought that were 6 foot or UNDER. He had 61 Fights, nearly 25 percent of the fighters he fought were 6' and under. But you are telling us HW Boxers are not taller nowadays? Ok Good, you have proved to us your Ignorance which works for me. Wikipedia is your friend, so is Boxingrec. I am not saying there were not tall fighters in the past, I am saying that Boxers now ON AVERAGE are alot taller and heavier. I used the word AVERAGE. Normal people understand this word. I will not hold this against you sicne we know what you are. I listed the Sizes World Champions in One of my previous posts that I'm sure you read and either did not comprehend ( NOt good) and Didn't understand ( really not good). Guess what? They are much bigger nowadays then in the past......Take this in slowly now, you can do it, we are all behind you and we are all pulling for you to get this. Fury is bigger than Foreman, I never talked about body fat percentage, you did. I said fighters now are bigger and taller than in the past. You want to talk about body fat percentages, no problem. That is a different topic my very slow friend. @Harrysachs. You are picking a few examples. The average heavyweight with today’s nutrition,PED. Creatine and all these supplements. No way are heavyweights bigger and taller in the 1970s. You gave a few examples of heavyweights. Like I said today’s heavyweights often come in with a bit of fan. But that does not mean they are not inshape or naturally bigger. Tashian Dong is a heavyweight who is billed 7 foot and 280 pounds. Look at Valev. The past had never had as many giant heavyweights on top. Smaller guys often held belts. Did you see when Fury fought Wlad what shape he came in. He lost so much fat. Muhammad Ali later in his career used to carry flab in fights. So did Foreman when he was older. How many heavyweights in the 1970s were as fit,big and muscular as Joshua,Wladimir,Vitali? Remember not one. All the traits combined? Wlad being smaller as a AM has no relevance to his pro career. Wladimir for the most part has been in the mid 240s range anyway. Your cherry picking. David Haye is a rare case you got. How many champs at heavyweight for instance were under 6 foot 4 at heavyweight compared to today’s game. Jordan87 what else is funny how you will pick and choose to prove your point. You will pick the heaviest Deontay Wilder weighed and say that is his prime weight. Most of Wilder's career he weighed under 220. Hell the last fighter against Ortiz he weighed 214. Lennox Lewis weighed 220 when he was in his 20's. He even weighed as low as 224 as a pro before he bulked up. Wlamidir weighed 207 as a amateur and 220 when he turned pro. There are various heavyweights now who weigh at low as 205. Be it Amir Mansour or David Haye. But you will ignore them. There were heavyweights back then like Humphrey McBride who was 6'4 340 pounds and Buster Mathis Sr who was 6'3 and 300 pounds. But the prove your point you will ignore that and just list what benefits your point. As I said George Foreman was 6'3 230 pounds as a teenager. You think he couldn't just add weight and come in heavyweight? Ali weighed as much as 230 in his career but he choose to come in light. Larry Holmes choose to come in light because he was a guy who used the ring. Lol you act like all of these guys couldn't just come in to the ring 40 pounds overweight. Being fat and being big are 2 different things. Foreman was a big guy. Tyson Fury is a fat guy. You also will have nothing to say about Leroy Jones being 6'5 and between 230-270. You won't mention Al Jones being 6'6 and 230-240 because it proves how dead wrong you are. Rob can you add Sonny Liston and Joe Frazier please? There have been so many changes to their listed heights by the years. Sonny was always listed 6ft0.5 and then 6ft1 while Joe was mostly listed as 5ft11.5 or 5ft11. What do you believe was the truth about those too great boxers? Frazier - the time I seen him - wasn't much taller than myself, but then he could look 5ft 10 range peak. We dont see the kind of shoes here but Ali almost always wore typical dress shoes. Dunno about Elvis tho. Perusing some photos of him he seemed to have varied a lot in how tall he looked. Ali I have at 6'2, and Clint would have close to an inch on him. I am one that doesnt think Eastwood was over 6'3, i'm sure you have seen this on the Eastwood page. He did claim 6'2" in the interview with Clint Eastwood. However, Ali also stated that Eastwood is taller than him. Evidence? Didn't think so lol. Ali at 6'4 is a total Joke, the man was very talented, no reason to give him 2" extra in height. I love crushing cans on this site. I listed him at his listed height below to prove a point about the size.....As Far As Joshua's actually....IDK he thought he looked about 6'5-1/2" with Rob, but had a .3" more Footwear So I felt he is closer to 6'5 than 6'6". Maybe 6'5.25". I know WIlder for a Fact is def Taller than Joshua. I really hope they fight in 2018. Sorry but Joshua’s taller than just 6’5”. He looks a solid 197cm. And.....George FOreman ( 70's)- 6'3 225, Larry Holmes- 6'3 215, Joe Frazier- 5'11 205, Muhammed Ali- 6'3 210, and Mike Tyson- 5'10 218. See the difference. Again, Not HarrySachs, but everyone else. Keep in mind this has nothing to do with Boxing skill. This is size relative to the heavyweight division. Guys like Joe Frazier has 10 times the heart that the Modern boxers....but he would be very tiny in today's game. See People like HarrySachs do not understand that all he needs to do is take the sizes of the Main Heavyweight champions of the last 100 Years and he will get his answer. Also Looking up their Opponents is not hard either. See a pattern? Not HarrySachs, I mean the rest of the normal People? Foreman was 220 to 226 for most of his prime fights ( Fact). Wladimir at was 240 for most of his prime Career. 207 ? Provide that link and tell me he fought most of his fights at that weight and you deserve a slap. Boxing Rec has all of the main fights and has weights recorded for it. If you think Wlad was 207 lbs during his peak than I need not say more, you just exposed your own ignorance. It is an undeniable fact that Heavyweight boxers are bigger now than ever before. Again I will say it, Ron Lyle and George foreman were considered " Big " Heavyweights in the 70's at 6'3 and 220-225 pounds ( When they fought). 220 is among the lightest heavyweights now, and most of the guys now are taller than they were in the past. Muhammed Ali at 6'2.5" would not be on the taller side of modern heavyweights. Google is a great thing, unless you are HarrySachs. Ernie Terrell ( The tallest opponent Ali Ever fought) was 6'6 and was 205 pounds.......205 pounds is not even a heavyweight anymore. Wilder is a thinner Heavyweight at 229, and still would bully Ernie around the ring. C'mon now. Joshua- 6'5 250, Wilder 6'6.5 230, FUry 6'7.5 260, Jarrell Miller 6'4 270, and the Klit Brothers would absolutely dwarf the competition in the 1970's. Jordan87 you are so hilariously wrong. Foreman was listed at 6'3 and 230 as a 19 year older. Wladmir Klistchko for example was listed at 6'5 and 207 in his early 20's. Foreman lost weight earlier in his career because fighters back then took their boxing career seriously. You didn't see many fat heavyweights back then like you do now. I also can name 50 heavyweight contenders in just the 70's alone who were between 6'3 and 6'6. I don't find an article or document where Ali was ever officially measured a certain height. Mike Tyson was listed at 5'11.5", and he himself has admitted to being 5'10 and doesn't look over that with Rob. And you think Boxing listed Heights are accurate? . Dillian Whyte is listed at 6'4, yet is 4" Shorter than 6'5-6'6 Anthony Joshua. In that picture of Ali and the Beatles, McCartney is closer to the camera so it appears that he is only three inches shorter than Ali. This is probably why people guess Ali was in the 6 ft. 1 range but he is clearly taller than that in other pictures. 6 ft. 2 1/2 is perfect for Ali. It is safe to assume that the official heights of boxers are accurate. Their measurements for reach are included in their official statistics, and they are weighed before witnesses from the media. It's because some of them are just fanboys who want their idols to be taller. Same thing with Charles Barkley, one guy actually commented that he was 6'6"-6'7" and also a few said he was 6'5.5"-6'6", when Barkley himself has explicitly claimed 6'4.75"
Because 6'3.5 could have been his peak height. It's not rocket science. Personally I think he was 6'3 even peak, 6'3.5 maybe fresh out of bed. People assume that everyone is always shorter than there listed height which is bogus. The taller someone is the less likely they are to fib about there height. Also people claiming 6'1 for Ali... get real, the dude towered over 5'10 celebs. Why are you adding 1" of height to HIS OWN HEIGHT CLAIM OF HIMSELF? Pictures of Ali with 6'1" Holyfield would NOT have been Ali at his peak height, untless those pics were from the 70's and early 80's. That is more than 3 inches but that's a weird angle. Ali does tower over them in flat boxing shoes though. Ali with the Beatles, all with similar shoe height. @Rob Can you add Laila Ali? Foreman was never taller than 6'3". He may have even been a centimeter or two shorter. There is no way he was 6'4". Not possible. Ali was a big dude. Look at him next to the Beatles. All of which were above average for their era, except Ringo. Both Bruno and ali had big heads, and that proportions always make people look shorter than they really are. That Ali/Bruno photo is awesome. Surprisingly Ali looks an inch taller than Bruno who was given as 6'3'' in his prime and probably was about this I'd say. Could be angles or footwear so difficult to tell from one photo. I think people underestimate how big Ali was in his prime though. I'd say 6'2'' plus and very robust. The older and very frail figure with Parkinson's is perhaps the image some people have these days. The young Ali was a big guy by any standards. Here´s with Frank Bruno which is listed in this site as 189.2 cm too. Ali was 190 at least. Height exaggeration is everywhere in sports. Height can be measured comparing to others. But the compared person can be taller than the real height in a list. And also have to consider both of their shoes and posture. Yes, and honestly Tyson was short for even the 80's era of Boxing. Frazier was around 5'10.5 and was considered short for a 1970's era fighter. Even Evander holyfield at 6'1" ( Proven with Rob) would be short in today's game. Big Heart though. I took a rough average of the guys Mike Tyson FOught back in the day, they averaged around 6'3". Thing is heavyweights are on average 20 pounds heavier than the Boxers in the 80's. Even " Big " George Foreman was only around 220-225 when he fought ali. That would be a medium size at best heavyweight nowadays. @Jordan. Nowadays it's different. U don't see 5-10 heavyweights. The Average Heavyweight is 6-4 I heard these days. I don't think their is a heavyweight belt holder under 6-3 1/2 6-4. It's a giants mans game. I say weak 6ft3 at peak - 190cm guy. He had a big head, which always makes you look shorter, but he was more than 6ft2 for sure. I agree. Fanboyismn is a thing but I never understood some people's logic with that. I am Shorter than Most of my Friends, mostly throughout my life. My Friends were mostly athletes or just tall Mofo's of German Stock. Point is , Height can be an advantage or Disadvantage but If you don't have Balls, it won't matter how tall or short you are. If People like to add inches to celebs to somehow better themselves, they need help. It's good to be taller in general, that I get but what about guys like Mike Tyson? 5'10 Boxer against 6'2-6'4 Guys on Average. What If Tyson said " I'm too short to fight" ? The man said he was 6'2. Why are people still trying to push 6'3? ali was a truthful guy in an interveiw with david frost and clint eastwood in 1969 he said that he was 6 foot 2 and 225 pounds . Rob, how likely is 6'2.75" in a good day for Muhammad Ali? Editor Rob: earlier in the day he might have got that, but I believe he got 6ft 2.5 and went with that as his official height, sometimes he might have rounded to 6ft 3. Hey Rob how tall do you think her daughter Laila Ali is? She is listed as 5'10. Editor Rob: couple of years ago she said she was 5ft 11 and 185 pounds, seems she's gave 5ft 11 a few times on twitter. Marciano is not over 5'9. Look at him in pics with 6'0.5" Measured Joe Luis. If you see a 5'10-1/2 guy then you have a problem. I love Marciano but I'm not going to lie to prop up his height. Movieguy, Marciano was about 4 inches shorter than Joe Luis who was measured on Film at 6'1. ( He had his boxing shoes on, which back then they were much thinner than modern shoes, Putting lewis at about 6'0.5). Marciano was 5'8.5 but hit like a mule. He put a 6'4 fellow Italian Fighter in a Coma with a Right cross. @Ryan: maybe it's just me. I can't see it. I know someone who has met him that is 6'3" and said they were the same. Foreman at best is likely strong 6'3". I respect your opinion tho and maybe he can look that because the other guys aren't really as tall as listed. I compare him to Ali and Norton Holmes etc and maybe the most I could argue is 6'3.5 but I have no reason to discredit what Forman said that he's 6'3. @Canson. Foreman could look it with other boxers though. Ken Norton was 6-3 and Foreman did look a inch or so taller.6-4 for Foreman is not a bad guess. No offense Reece but you have a double standard. You will take what Ali says that's he's 6'3 218 (who knows if he rounded or not) and make him solid 6'3 and inflate foreman who also claims 6'3". You say foreman downplays his height for "pshychological advantage ". You also take someone like Fury just because he claims 6'9 and say that Wlad Klitschko is downplaying his height from 6'6 to 6'5. So from reading those posts it shows that you take whatever the higher claim from the person is and inflate the person next to them in order to accommodate Ali Fury etc. I agree with you Harry Sachs. Ali on his passport had 6'2.5 and looked shorter than Norton and Foreman and others. Foreman was 6'3 strong at his peak tops. He claimed 6'3 that's what he was somewhere in the 6'3 range between 6'3-6'3.5 nor 6'3.5 to 6'4. Or else he would've said he's 6'4"
David yeah Ali was 6'3 peak even though he was shorter than the 6'2 3/4 inch Norton. Brilliant logic you have there. Click Here Ali looks taller than 6,2 with Martin Luther king. Strange Ali would say this! looks taller than 6,2! Ali looked at 6,3 to me. i think Ali is 6,3 to 6,3.5 and Foreman was 6,4. Foreman was slightly taller. Yes, agree (with Skn), Ali himself said that he was 6 ft 2 (or 188 cm) tall...but if Ali could have been more accurate, I feel that he would have said that he was EXACTLY 6 ft 2.5 inches (189 cm) tall! Now that measurement I can wholly agree with. I looked at the this pic with Ali and the Beatles he towered of them in flat boxing shoes. he looked a strong 6,4 in that picture. i think Ali was 6,3 in the 60s and 70s and still 6,2 in 80s and 90s but could easily be mistaken for a 6,4 6,4.5 guy due to his slender shoulders in his peak. Ali 5,9 stop trolling. i doubt he was much more 5,10-5,11 in his older years he lost a lot of height.Click Here look at this picture Ali towering over the Beatles,it reads 218 pounds,6,3 the Greatest 22 years old. Ali was a solid 6,3 no less. Wow his height is really overrated here. Here he is with 5'8 John Lennon and he's barely got an inch on him. Ali was 5'9 max 5'10 on a good day. He got a bigger than the world attitude but he really wasn't as tall as people made him out to be. So here you have the truth. Muhammed Ali was 5'9. 6'3" was his peak height at the tallest. So he would've most likely been less at the time of his death. Ali was billed 6"2' in the 60's. Ken Norton were also 6"2' but still a Clear edge om Ali. Nu best guess 188 cm. Right between 6"1.25 Holyfield and 6"2.75' Norton. Ali was definitely a full 6'3 or more at peak height and maybe 6'2 at the time of death. The 6'2.5 was probably in his older years. Rob: in this pic what do you think the difference is? 1 cm or 1 inch? Rob: Do you really think that it is a 1.25 inch difference between Ali and Holyfield in this picture? Dundee said Ali was 6,2 but that was before Age 21 and men can still grow up to 21 i think and apprently some even grow until 25. Dundee said before the Terell Fight you can look at the whats my name part 1 and part 2 on YT says Ali was 6,4! i do not think he was 6,4 Probably a little under. the Real Debate should be weather Ali was 6,3 or 6,3.5. he was taller than 6,0.5 Liston b 2.5 inches. he was no more than 2-2.5 inches shorter than 6,6 Terell who was actually 6,5.5. With Ali being towered by the Klitschko's in the pics I think it is clear that by this point he was not a well person and had lost height. In his prime he would have been shorter for sure but not by so much. Click Here A picture with Vitali Klischko and Wlad with Ali. Lol Thomas Foreman was measured at 6'3 and Foreman was clearly taller than Ali. Ali was never measured at 6'3.5 barefooted. You dudes who make up lies to try to prove your point crack me up. His passport from 1972 said 6'3", his passport from 74 said 6'2.5", the an interview with howard cossel they measured him and said he was 6'3.5 with a wing span of 6'5"
One of the greatest boxers of all time hands and head movement none can match. He didn't look 6 3 was dwarfed by foreman height and mass. I'd guess under 6 2 prime more like 61. Joe Frazier was given as 5'11.5'' at the time. He might have been shorter nearer 5'10''. Actually, I reckon 5'11 flat might have been Fraziers height. I think he wore big heels at times to look near 6ft to compensate for being one of the shorter heavyweights. Rob, how tall do you think Joe Frazier was in his day, 5'11.5 ? @Canson thanks and same towards you and your beliefs and i also appreciate the clarification. Henry Cooper has said that Ali was 6'3'' when he fought him. In later years he met him and said it was sad to see how small and frail he had become. Maybe he wasn't quite a full 6'3'' but he was a big guy for that era. Whenever I have been measured I was standing rigidly straight and craning my neck. This was, of course, to increase my measured height, as if it were a score. Since I don't walk around all day like a giraffe reaching for a high leaf on a tree, my real, everyday height is an inch or so less than my height as formally measured. I prefer describing people as towering, tall, medium, short or dwarfish. The actual numerical measurement is an interesting statistic, but it's less important than the actual height cohort to which the subject belongs. So Muhammad Ali was tall. Six-two, six-three, well, still tall. Of course, descriptors of height depend upon the populations in which subjects operate. If Ali had been a professional basketball player, he might have been fairly described as short, or at least not tall. My simple point is this: if a person can measure a height -- whatever time it is -- it is absolutely real and legit. I mean, they measured it and stood that tall barefoot so it is indeed a true height as well as a max height. If some want to use a different method that is great, but it is silly and inaccurate to assert that an out of bed height is not real. It obviously is if the man or woman is barefoot and the measurement is properly done. No way to realistically make it not so. I mean again, the person is standing that tall flatfooted, barefoot and without footwear. It is as real as can be lol. As for me Ive never had anyone discredit my height claims, whether it is 6'2" barefoot or 6'3" in shoes. Being around athletics and just where i live, it has always been rather common to use shoe heights but i still tend to specify which im referring to. Ya what Shane is talking about is the matter of how far our height could reach out of bed but it really is dependable at what height we hold because you could be displaying a height of 5'9 for most part of the time when your with your peers or family(with your max height being 5'10) due to a number of factors and your MAX height you woke up with at each day differs due to sleeping time etc but one thing that remains almost unchanged throughout all this is your average height and it is more dependable, solid and more accurate to go with the average height when measuring people. Shane your asking why would anyone claim anything shorter? Imagine you just woke up and your going for a physical from a doctor the journey took 3 hours and the doctor measured you at 5'7 what are you gonna do tell the doctor your 5'8 because you woke up and measured yourself at that height? Listen..... going with out of bed height could never be or sound more ridiculous because a person could be the same height as you on average and wake up taller than you due to their spinal discs being more hydrated than you and your gonna seriously say that person is taller than the other? Even when they are measuring the tallest person in the world for guiness world record they wait for their spine to decompress to their average height that they can hold mostly throughout the day....But anyways since your so on about out of bed height should be the true height then go ahead and tell people your max height and see how many probably will go against what your saying. @Dmax: its the persons max height without shoes why on earth would anyone claim anythibg shorter? Its silly to think its not genuine as if a person is on their tiptoes or in shoes. Quite simply, if a person can legit measure it barefoot at some point in the day they certainly have every right to legitimately claim it. Its simply a persons max height and its every bit real. In fact, ive never heard of this concept of not counting full height as being real. Its comically ridiculous and a bit mind boggling. I think he was a legit 6ft3.I saw a pictures of him overseas and noone ever is taller or as tall as him besides his one or two of his crew members . -Every human stops growing at different ages. Some people here act as if its a set age. Its not. Some quit by 14 or 15 and some in early 20s. It varies from persom to person. -IF Ali was measured for passport, its likely it was in shoes BUT in that time a normal show was often shorter than those of today so if he had a 1/2 inch heel he would still be 6'2 barefoot and if measured at night, perhaps 6'2 1/2 to 6'2 3/4 barefoot in morning. -Speaking of morning heights, its absurd to not count out of bed height as a real height. A person is indeed that height and their optimal height at that time. I in fact believe that should be the standard as it gets people at their true full height and not one shortened after compression from sitting, standing. But either way, its certainly not illegitimate when a person in fact can stand that tall. Thats crazy. V SAD TO HEAR OF HIS PASSING. Sugar Ray Leonard was a great boxer & great businessman, but Ali was simply A GREAT FIGHTER! The world will never see anything even close to his like again! He may not have been the v fastest ever, or the hardest puncher, or the most modest of men (lol), but perhaps the smartest world heavyweight champion (inside the ring) in history...to this day, I still think that his battering of Big George Foreman was an unbelievable spectacle to behold! I am so happy that the celebheights team have stuck to their guns & kept Ali at 6 ft 2.5, when many other sites & publications have not been accurate & have stated 6 ft 3 (or even 6 ft 3.5!). THEY ARE WRONG AND YOU GUYS ARE RIGHT. Perhaps, with the fullness of time, others will realise their error, come round to your thinking & match your 6 ft 2.5 inch listing for this BOXING GOD. Burt Sugar once said he was the tallest 6'2" guy he ever saw! No matter how tall, the best heavyweight ever! RIP Champ! 6'3. Rest in peace champ you were the greatest. 6'1" at peak I can buy, but no more than that. The world has lost another legend.....Despite his time period where blacks were treated with such disgrace that can break many peoples self esteem he believed in himself that he will become the greatest and even when things got hard for him he stuck through the storm during his defeat and came back like an unstoppable force to be reckoned with....R.I.P Muhammad Ali. RIP to Ali. As great as a boxer as he was I believe he was even better known for his work outside the ring. Great man! People shrink as they get older. My dad and I were the exact same height, 6-3, at one time. Years later he is 72 and about 6-1. I noticed it really progressed as he approached and passed the age of 60. All of Ali's bad health, and poor posture due to same, would have had great effect on his height as well. If you are trying to determine Ali's height based on pictures, I would use those of him before age 50. R.I.P. Muhammad Ali weather you were 6'2 or 6'3 you were the greatest to ever be. Ali was half a hair's breadth under 6'3" at his peak. It wouldn't be incorrect to call him 6'3"
Does anyone know how tall Rocky Marciano was? Officially he was 5'11'' but I suspect he was shorter in reality. He only weighed approx. 184lbs and given his thick set physique was likely well under 6ft to weigh so little. Ali and Marciano boxed a 'fight' that was decided by a computer and there is a picture of them standing next to each other at the start of the 'fight'. Ali looks gigantic compared to Marciano. I know Marciano doesn't mean much to most younger people but he is generally considered one of the great heavyweight champions. Modern heavyweights are so big compared to those from previous eras. He's claimed 6ft2, 6ft2½ and 6ft3. Ali doesn't look great in that photo next to Jim Carrey. I think it is clear that his stature has been effected by his illness. I think that a downgrade is in order. There's no way that there is 1"-1 1/4" inches between them as Muhammad Ali is closer to the camera. There are photos of him by Jim Carrey, who was around 6'1 1/4"-6'1 1/2" in person, and they look about the same in height (some photos show Jim as taller, while others have Muhammad Ali as being up to 3-4 CM taller). I don't think that there's more than 1-2 CM between them, so perhaps Muhammad Ali is no more than 6'2" flat? Henry Cooper said Ali was 6'3.5''. Joe Bugner said he was 6'3'' although Ali did look a fair bit shorter than 6'4'' Bugner when they fought. His own trainer Angelo Dundee said Ali was 6'2'' but carried himself to give the impression of a bigger man. However on another occasion Dundee gave 6'4'' for Ali's height. I've read stuff by people that says how shocked they were at meeting Ali person, they couldn't believe how big he really was. I also remember an article about meeting Ali and the author being surprised how small he was. Who knows? Doubt he was under 6'2'' is all I'd say. Id say 6-1.75. Not a full 6-2" guy. I would imagine it varies, but from what I've gathered from seeing the passport/driver's license of multiple famous people, it's usually measured with shoes on, if it's measured at all. They are not going to ask you to take your shoes on because your exact height is not that important - they just want to know your approximate height. The same goes for mug shots, which are not really intended as a completely accurate measurement but rather is a way of getting two things done at once - getting a picture with name and other information as well as an approximate idea of height. If you're suggesting that Ali might have been shorter (in his prime) than his current listing with your comment, you need take a closer look at him. I think this listing is very good. anyone know if passport height is measured barefeet? Not the best picture as his head is raised, standing next to 5'10ish George Harrison with what looks like a 1 inch shoe advantage. Jenner could look a strong 6ft2 when he was younger. In 1966, Ali fought Cleveland Williams who was listed at 6'3" and Ali was every bit as tall and much thicker build from head to toe. I saw Ali in 1988 and he was at least 250 lbs and in very good shape still. He carried that weight not problem. I feel I am a good judge of his height and weight as I am 6' 3" and 330 lbs and my dad is 6' 4" and he was with me at the time. Any body say Ali was less than 6' 2" back in the 60's, 70's or 80's is off is rocker!!! Larry Holmes was not any bigger than Ali either!!!! Like I said before when I saw him a couple of time in P.R., early 1976 , no way that he was 6'3, not even 6'2. Another fact is, most of the heavyweights ,in those days the were small, but good. Back in the 70s , was real competition. The tallest in those days were, Wepner,Buner & Foreman. Any way Ali, was a tall guy in those days. I got pretty close to him after an exhibition in 1971. He was in his boxing shoes (flat). I'd say he was 6' 3" tops, certainly no less than 6' 2 1/2". I was 6' 4" at the time and he was definitely not as tall as me. What stands out is his blindingly fast hand speed and ability to strike from unexpected angles. Also, chiseled physique. When I saw him in person, a couple of time in Puerto Rico , from January to February, 1976 , getting ready for his fight against Jean Pierre Copman, his height, it didn't impresve, but yes, his body. He was a big guy, more than I was expected. In concern to his height, I would say, thahe was about 6 feet 1 1/2 , not even 6''2. He might be down from his peak height now a days. Probably closer to 6'1". No Chris, only the weights are reliably measured. Foreman was peak 6'3'' according to every source i have seen, and anyone could see that Ali was slightly shorter than Foreman. But there is no way Ali was shorter than Ken Norton, whose height, reach (and peculiar style) Ali could never cope with, so Ali was a rock solid 6ft 2.5. The height of many of Ali's opponents was exaggerated. Ali towered over Liston, who was only half an inch over six foot. Frazier was a full inch under six foot and short armed to boot. Gold medal was won in 1960 when he was 18 years of age. May have grown a little afterwards. Watched a video where Dundee stated "my man was 6'1" and Liston was 6'".... Ali could have easily been a little taller... but not measuring to 6'2". I buy Bayou Bill's statement. 6'2.5" is a little bit overestimated for cassius clay. A famous journalist who commented boxing for 50 years, met clay many times. This Journalist was a legit 6'1"(185cm) and cassius clay was just a little bit taller than him. Peak height for Clay was 6'1.25"-6'1.5" (186-187cm). So i am totally agree with Bayou Bill. Up close to him when we boxed in the ams... he was about 6'1.5 at the time. Rob,I read a very old book (from 1977)in my aunt's house last summer.I remember he was listed at 190,4 cm and 96,9 Kg.I have absolutely no idea whether this was in his boxing shoes or barefeet but to be that precise I'm assuming it's barefeet,so a little upgrade to 6'3? Rob, any idea how tall he is today? 6ft 1? Knowe: How the hell can Eastwood be 6 ft 1, when he is obviously taller than 6 ft 2 Ali in the video & in everything else - even Ali acknowledges that Eastwood is the taller man! Talk sense! Saqartvelo, In this video Mr.Ali says he is 6' 2" (not 6' 2" and a half or any thing like that). But he is rated 6' 2.5" in most of the sites and he looks exactly that in all his fights and videos. Probably he rounds it to 6' 2" while mentioning it. saqartvelo: thanx alot for bringing attention to this yt video interview of Ali with the great man saying himself that he is 6 ft 2 inches tall. So, there we have it, END OF ARGUMENT, & yes, Ali was never ever 6 ft 3 during his entire life! Ali was the greatest, but what about his greatest rival (though I will go to the grave thinking that Ken Norton is the only guy who gave Ali serious trouble & beat him 2 outta 3) Joe Frazier??? Rob, please do an entry for Smokin Joe. My guess is that he was around 5 ft 11 (180) in prime as 191 cm George Foreman towered Joe! Solid 6' 2.5" during his hay days. Nothing less than that. So 6'1.5 - 6'2 barefoot.. Passport-height was measured with shoes on, no? No matter what his height, he was bigger than life. "Peak height was 6ft 2.75in (190cm)"
I met both Ali and Foreman in their primes. I am 6-3.5 exactly, barefoot. I fealt strongly Ali was the same height as me within 1/4 of an inch. On the other hand, Foreman was about 1 inch taller than me, more like 6-4.5. I am very confident with what I am saying. He was 6ft. 2.5 in when he fought sonny liston(he was 22 years old that time). Man grows until 25. If you are not basketball player or swimmer(these kinda sports increase height very much) you can only grow a half, maximum one cm more after 20 years. It is not easy to find out human's exact height. For example , when I measure my height sometimes I am 189.5 , sometimes 190, sometimes 190.5....it is quite strange thing. Ali and ken Norton stood about same height. also ali and ron lyle. norton was 190 cm, ron lyle about 191. IM 6'5 AND MET ALI IN 1981, AND I'M ALWAYS CURIOUS ON EVERYBODYS HEIGHT. ALSO WHENEVER I GUESS ANYONES HEIGHT I'M 95% RIGHT. SO ALI'S DEFINITE OFFICIAL HEIGHT WAS WHEN I SAW HIM WAS 6'3 TO 6'3 AND A HALF. He should be AT LEAST 190 cm in his prime. he was not 6'3". And a little bit shorter than listed here. I'm a former pro fighter. I met Ali in the lounge at the Forum in Inglewood. We posed for a picture side by side. We were both wearing flat shoes. I stand 6'-3.5". Ali is about 1.5 to 2" shorter than I am. The picture was taken in the late 70's. People, Ali started his pro career as a skinny teenager still growing, his trainer Dundee even said he grew a bit. That explains his early 6-2.5 listings. But I dare you find him anything under 6-3 ages 21 onwards, after defeating Liston and all. I'm sorry but for someone as prominent as Ali compared to the likes of 5-10 Beatles he dwarfed, or Wilt Chamberlain, I'm surprised it's a no-brainer that the man once easily stood over 6-3. He did get listed at 6-2.5 for some fights when he was younger, so I doubt he was the full 6'3 at peak. They wouldn't have just randomly knocked off half an inch. He must have been measured at 6-2.5.